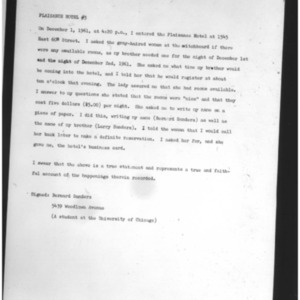 The first document is his testimony as a housing tester for an action related to efforts by University of Chicago CORE to integrate off-campus buildings owned by the University which refused to rent to Black students. 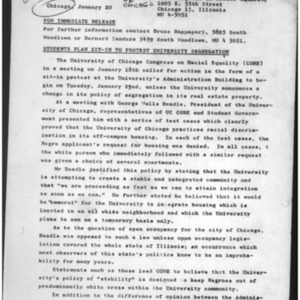 The second document is a press release by University of Chicago CORE announcing its plans to protest against the University of Chicago if it did not desegregate those same apartment buildings. This led to a fifteen day sit-in at the University's administration building partially led by Sanders. 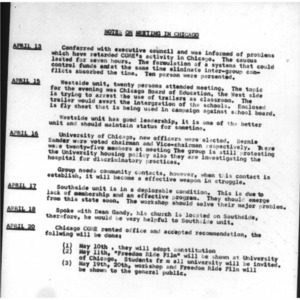 The third document is a page from "Report on Chicago's CORE", an April, 1962 report on the CORE chapters in Chicago written by field secretary Jerome Smith (presumably of New Orleans CORE). On this page, Bernie Sanders is stated to have been just elected as either the president or vice president (it's unclear which) of the University of Chicago CORE chapter. 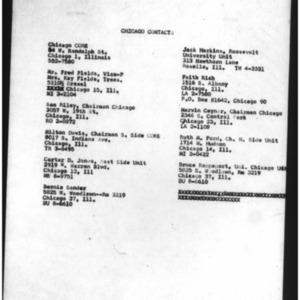 The fourth document is a list of CORE contacts in Chicago. Such documents usually list the highest ranking local CORE leaders, usually the chapter chairman and other local executive officers. Bernie Sanders in listed. These documents come from the The Papers of the Congress of Racial Equality, 1941-1967 microfilm collection, reel 19. Congress of Racial Equality, “internal CORE documents listing Bernie Sanders as member of University of Chicago CORE,” The CORE Project, accessed April 24, 2019, http://www.thecoreproject.org/omeka/items/show/74.